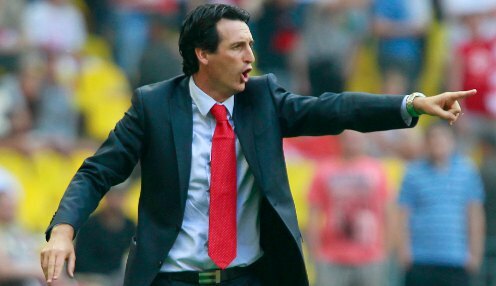 Sevilla coach Unai Emery heaped praise on his players for staying strong throughout the Europa League final against Benfica after triumphing on penalties. The Spanish side, who were playing in their 19th match of this year’s competition, had chances to win the game in 90 minutes and extra time but were eventually forced to hold on to take the match to a penalty shoot-out. The Andalusians held their nerve from the spot to win a third successive European final 4-2, Kevin Gameiro smashing home the winning penalty after Oscar Cardozo and Rodrigo had missed for Benfica. Emery was full of admiration for his players for fighting hard throughout 120 minutes and admitted the game could have gone either way as Benfica played their part in a tense goalless draw. He told AS: "Benfica deserved to be in the final and so did we. At times the game was totally even, but by the end they were doing most of the pushing. "You could tell our players were suffering from fatigue and physical discomfort but this team has learned how to suffer. "We have learned how to stay strong and so we were ready for that." For Benfica it was an eighth straight European final defeat and ended any dreams they had of completing an unprecedented quadruple having already won the Portuguese league title and the Taca da Liga. The Eagles will now have to lift themselves for the Portugal Cup final this Sunday, a game they are 1/1 to win, with opponents Rio Ave 1/1 to inflict another final defeat on the Lisbon outfit. Benfica boss Jorge Jesus was left cursing Benfica's luck after the game, claiming his side had been the better team over the 120 minutes before the penalty shoot-out. Jesus said the “best team did not win the Europa League" before adding: “Sevilla started off better, but as match progressed we improved and we were the better team.